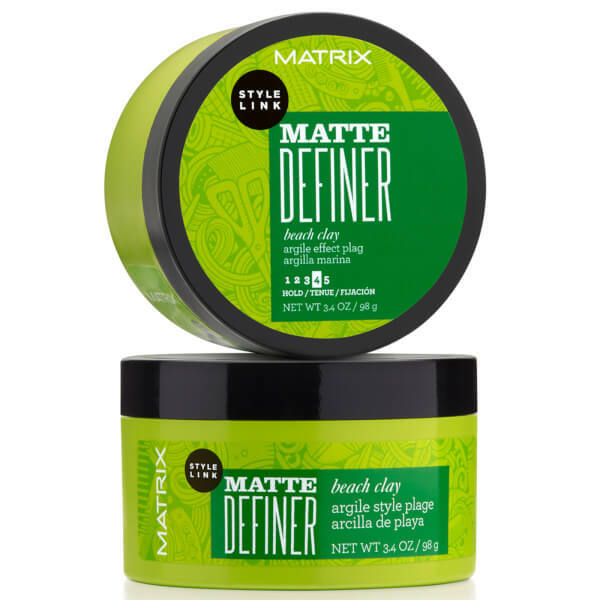 Show your hair who's boss with the Matrix Style Link Matte Definer Beach Clay, a strong hold styling clay that creates texture and definition with an edgy, matte finish. 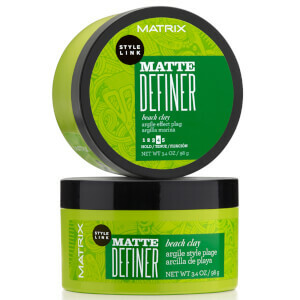 Allowing you to create different styles without the messy build-up, the innovative clay works to add choppy, windswept definition to shorter styles, laid back, beachy bedheads and separated, texturized strands. Very strong hold. - K.N. Rub through fingers and work through dry hair. Aqua / Water, Cera Alba / Beeswax, Va/Crotonates/Vinyl Neodecanoate Copolymer, Bis-Diglyceryl Polyacyladipate-2, Cetearyl Alcohol, Tribehenin, Paraffinum Liquidum / Mineral Oil, Ceteareth-33, Peg-40 Hydrogenated Castor Oil, Propylene Glycol, Kaolin, Caprylic/Capric Triglyceride, Phenoxyethanol, Aminomethyl Propanol, Parfum / Fragrance, Sorbic Acid, Methylparaben, Ethylparaben, Limonene, Benzyl Alcohol, Benzyl Salicylate, Linalool, Citronellol, Ci 15510 / Orange 4, Ci 14700 / Red 4, Crotonic Acid/Vinyl C8-12 Isoalkyl, Esters/Va/Bis-Vinyldimethicone Crosspolymer, Coumarin, Geraniol, Ci 19140 / Yellow 5, Ci 42053 / Green 3, Hydroxycitronellal, Citral, Ci 60730 / Ext. Violet 2, Isoeugenol, Ci 42090 / Blue 1.